Who is afraid of monsters? Already Friedrich Nietzsche knew that a child is hidden in each of us – to transform him into our time – a child who wants to play. In hardly any other activity does this childlike pleasure in playing manifest itself in adults as genuinely as it does when they play music. In particular, improvisation should be about nothing more than playing with all available and imaginable components of a given context. This is also how the Swiss-Norwegian alliance, based on the pianist Christoph Stiefel and saxophonist Karl Seglem, sees it. When children build castles in the sand, it is easy to see that their entire architecture is based on improvisation. Who would imply that the child does not work with the utmost seriousness? Painters such as Paul Klee and Joan Miró, but also the poet Ernst Jandl, have transferred this playful seriousness or serious playfulness into high culture. Even Seglem and Stiefel fall back on the same intuitive handling of the spontaneously feasible, but they not only incorporate the childlike and all-too-childlike, but turn to children from 5 to 99 and call the whole thing Hopp (and smile!) and Monsterjazz. Optimally tested – live in front of small and large or young and old children – the band went into the studio in 2016 and is now releasing a brightly colored double CD with short collective improvisation and melodic threads that run throughout the entire album. The album consists of two separate parts, each of which belong together in content and aesthetics, but stand for different angles of the musical process. The length of both CDs together corresponds to that of a single CD, but already when you listen to them fleetingly, you hear revealed a different narrative attitude. The first CD is entitled Hopp (and smile!). Although it is based on how children experience music, it is explicitly aimed at the experienced listener, one who knows how to consciously focus his or her spontaneous perceptions. Here, the clarity of the playful sequence is at least as important as the immediate expressive impulse. The second CD, Monsterjazz - An Interactive Jazz Journey For All Ages, contains the Monsterjazz program for children. This shrill, playful program makes you feel like you're digging in a huge old wooden box with colorful marbles. What could be hidden under the visible? The familiar triggers the unknown, and when the unknown transforms into something known, a new unknown waits beneath the surface. Maybe a monster. Improvisation as a mystery play of the elements. The protagonists do not hide behind a sugared Pippi Longstocking aesthetic, but take the child in the child as seriously as the child in the adult. Children, no matter their age, are radical, and so is this music. In the process, the music should not give the impression, however, that one wants to separate the world of children from the standards of adults. Indeed, the smoking area is not separated from the crawling area, but rather it is about one and the same access to music. There are two projects in one, only CD 1 is for people who consciously grasp the music, and CD 2 is more for young listeners who unconsciously engage in it out of curiosity like from a shoe box full of crayons, a toy highway or a wrestling match in the high grass. But only together do they make a whole. Perhaps it can also be compared to a two-act play in which each act is directed to a specific audience, but which invites the other audience at the same time. This is how Seglem and Stiefel – together with singer Jullie Hjetland Jensen, bassist Trygve Waldemar Fiske and drummer Kåre Opheim – succeed in making the performance character audible in an exemplary way on their double CD. The five musicians not only represent themselves and the community of the group, they also create the space in which their scenario unrolls. With their 3D project, Christoph Stiefel and Karl Seglem succeed in no less than in opening jazz up to new listeners and perspectives. And last but not least, they give their monsters back to jazz. 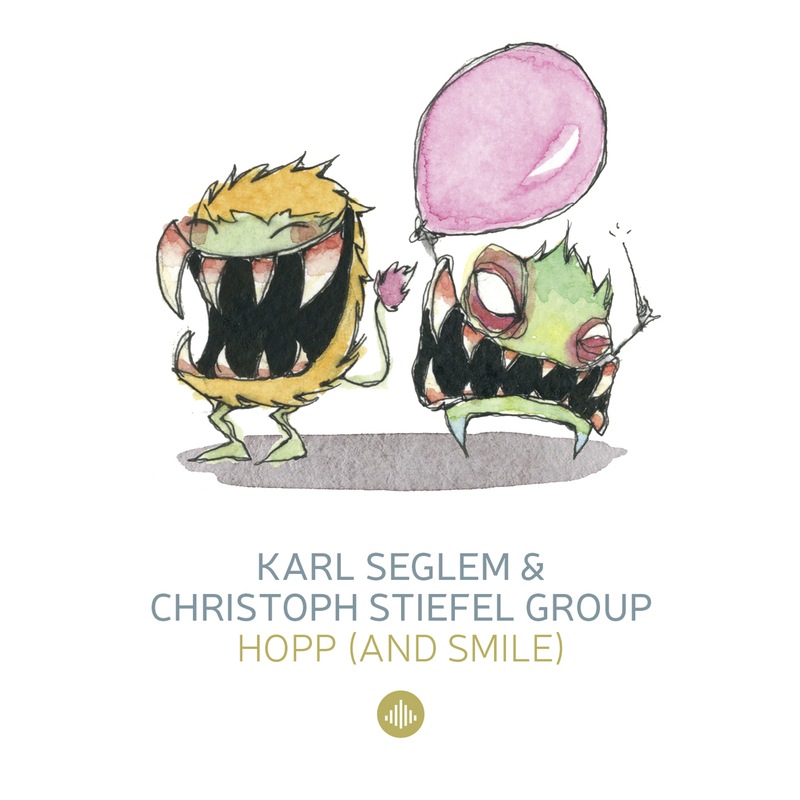 "The Norwegian saxophonist / geithornist Karl Seglem and the Swiss pianist Christoph Stiefel Group release the child in every person with the double album Hopp (And Smile) / Monster Jazz." "... It is improvised full of relish, melodies always get new twists, rhythms change, the serious has a humorous and sometimes childlike undertone in this music. ..."